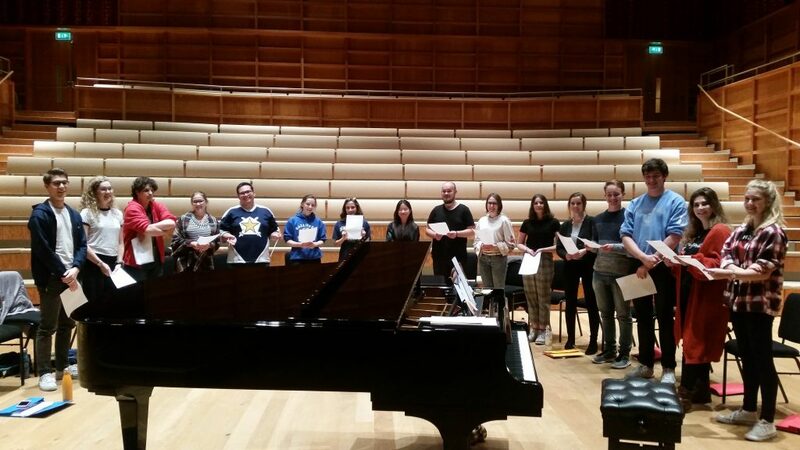 Amongst its many performing commitments this year, the University Chamber Choir is busy preparing a new piece being written especially for the choir and ensemble by Deal-based composer and performer, Anna Phoebe. Anna’s new piece, Between Worlds, is a distant cousin of the Cellular Dynamics project, a collaboration between the Music department and the School of Biosciences exploring links between music and science. What’s new about Anna’s piece is that it is a direct, original musical response both to scientific research and to the laboratory environment, drawing on hi-resolution spectroscopy, video evidence and even sampled sounds from the laboratory to create a musical reflection, or response, inspired by the material gathered. 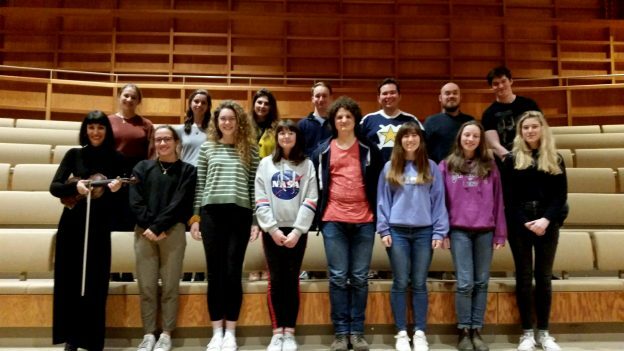 The Choir had the opportunity to work with the composer at Tuesday night’s rehearsal, at which Anna also played the violin in two of the movements. 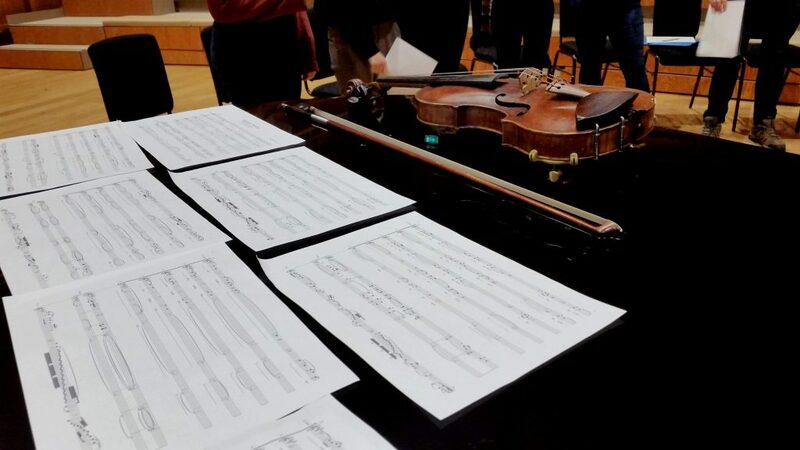 One of the sections features a dialogue between solo soprano and violin above a slow-moving choral backdrop, and it was thrilling to hear the solo violin lifting and skirling around the concert hall, weaving highly decorative arabesques around the soaring soprano line. It’s the first time that Anna has written for choir, and it’s apparent that she has an innate grasp of writing for the ensemble, structuring the vertical sonorities to create colours and contrasts. 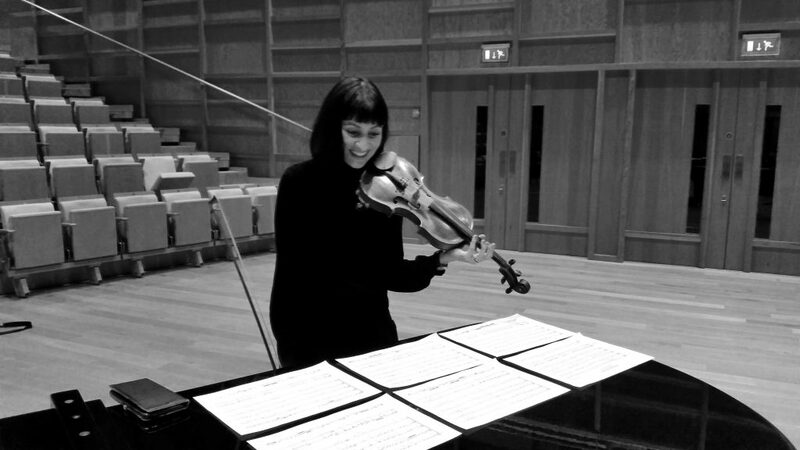 What is striking about the piece is that it’s an engaging emotional, and highly expressive, response to the scientific environment; Anna’s musical language employs added-note chords and suspensions, the occasional slight portamento effect in the voices, creating a richly-colourful musical landscape. Her vision for the piece is cinematic in scope, and there are some scintillating dissonances, highly-charged moments that require the choir to know exactly where their notes are, and to have courage to sing them confidently to make the dissonant colours ring. Elsewhere, the texture includes field recordings made in the laboratory – the clinking and tapping of day-to-day lab equipment – such that the music sounds as though the lab itself is stirring into life; the fabric of the laboratory environment reaching out from the visual imagery and to become part of the sonic environment, a unique connection between science and sound. Last night’s rehearsal was the first step in building the composition, and putting the choir and solo lines together; there were some wonderfully atmospheric moments (notwithstanding the fact that several members of the choir were away that night) that have the Choir looking excitedly ahead to further movements as the piece unfolds. This entry was posted in In rehearsal and tagged Anna Phoebe, Between Worlds, Chamber Choir, new music on January 31, 2019 by Daniel Harding. 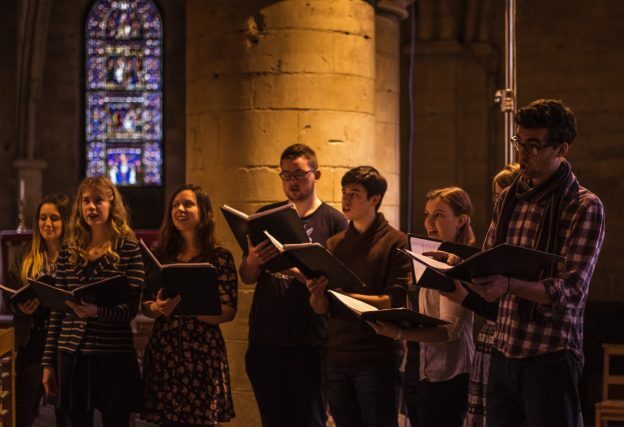 As part of its programme of contemporary works this year, the University Chamber Choir has been developing Blest are the Pure in Heart, a strikingly colourful anthem by James Webb published by Chichester Music Press. The piece reflects the tone of the text (Blest are the pure in heart, for they shall see our God) in revelling in the sparse beauty of the open fifth, first heard at the opening in the sopranos and altos; the tenors and basses reply with the same interval on the dominant, creating an overall chord built now on fourths; the upper voices re-present their initial fifth, prompting the lower voices to respond with another open fifth, now on the mediant, which creates a contrasting combined sonority of a first-inversion major seventh. The simple juggling and combining the same interval at different transpositions creates three different gestures within the first two bars – an evocative start to the piece, which then unfolds in a more melodic fashion, but with the harmonic language still underpinned by the prevalence of the open fifth. It’s as though the music is trying to work out how best to respond to its first chord, exploring options in order to find the most suitable; its dissatisfaction with the first two (wonderfully colourful!) 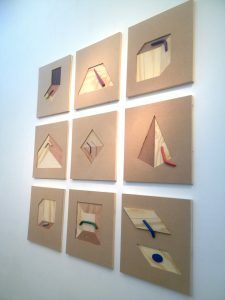 choices becomes the catalyst for the rest of the piece’s gradual unfolding. Later still, when the opening returns, the music unfolds to include a flattened sixth, a small harmonic moment of great expressive power; the piece concludes with a final presentation of the opening gestures which now resolve into the tonic major, but hovering in second inversion, giving the end a wonderful sense of weightlessness. 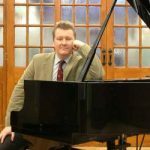 A former producer with BBC Radio 3, James Webb also won the inaugural BBC Young Musician of the Year Composers Award in 1992; his music has been performed by groups including London Voices, the Delta Saxophone Quartet, and the Royal Philharmonic Orchestra. We are very much looking forward to performing this work in the resonant acoustics of Canterbury Cathedral and elsewhere as part of the Choir’s repertoire during the course of this academic year; it will work especially well in the evocative surroundings of the Cathedral Crypt in May. Find out more about Chichester Music Press here. This entry was posted in In rehearsal and tagged Chamber Choir, Chichester Music Press, new music, new repertoire on November 23, 2018 by Daniel Harding. 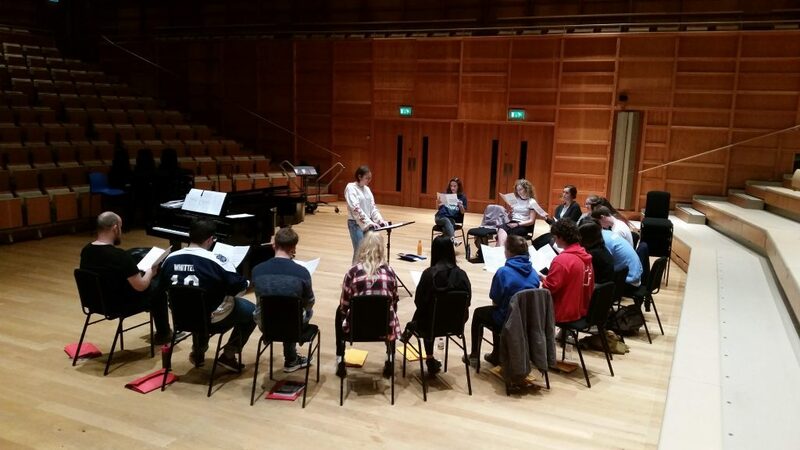 With two days of auditions over, this year’s University Chamber Choir is underway and preparing for a particularly busy calendar of performing commitments throughout the course of this academic year. Comprising both undergraduate and postgraduate students from across the University community, this year’s ensemble consists of eighteen singers, who will be working towards the usual events in the choir’s annual choral calendar, as well as some exciting new events (about which more anon…). 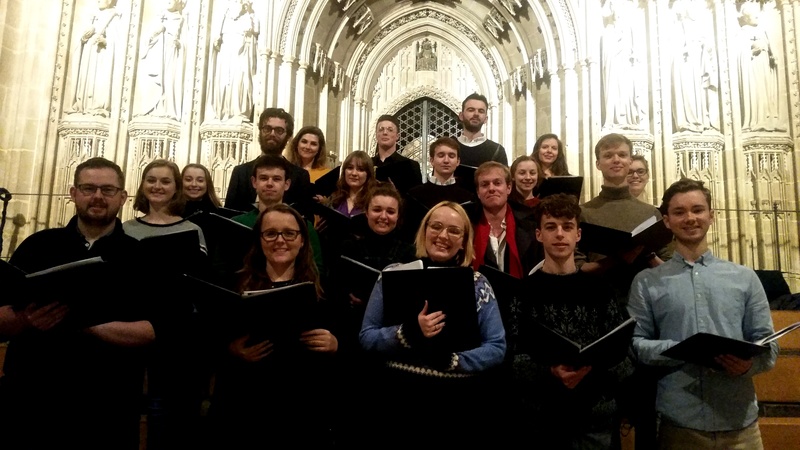 Our first public engagement will be the University Carol Service at Canterbury Cathedral in December, always a magical opportunity for the Choir to take flight publically for the first time. Later in the year, we’ll also be singing Choral Evensong at the Cathedral, and giving our annual concert in the Cathedral Crypt; also in the diary are a return to St Michael’s Church, in Hernhill, for a meditative sequence of music and silence by candlelight in Breathing Space, a performance at Wye Church, and the performance of a new piece for choir, strings and electronics, for which rehearsals will start in November. This year, the Assistant Conductor is second-year Hannah Ost, who also MDs with the Musical Theatre Society, and recently completed a busy summer working at the French Woods School of Performing Arts in New York. This entry was posted in In rehearsal and tagged Chamber Choir on October 15, 2018 by Daniel Harding. The University Chamber Choir is forever tackling contemporary works as it develops its repertoire for the annual Crypt Concert, and this year includes the haunting O Vos Omnes by the American composer, Sarah Rimkus, in its programme. O all you who walk by on the road, pay attention and see if there be any sorrow like my sorrow. Pay attention, [all people] and look at my sorrow, if there be any sorrow like my sorrow. and treads a wonderfully ethereal line between medieval plainchant and a sparse yet colourful modern musical language, rich in open fifths. The harmonic language unfolds in a slow procession of colours, as though the listener is passing a series of stained-glass windows, that is highly expressive, yet wonderfully understated; the recurrent motif, first heard right at the opening, is built from the melodic line, broken up across voice-parts and with notes extended such that a four-note cluster chord arises as a vertical incarnation of the linear melody. It creates a wonderfully ambiguous tonal landscape, as the listener is moved across harmonic planes without ever quite knowing how they were taken there; it’s only with the return of the melody, hummed gently above a tonic pedal, at the conclusion of the piece that our feet touch the ground once more. In places the music unfurls in steps of an open fifth to build very stark sonorities, answered by lines that rise and fall like plainsong above a pedal-point, creating tension between motion and stasis. There’s a yearning quality to the shape of the melodic line, which, for all its motion, cannot escape the tyranny of its starting note. 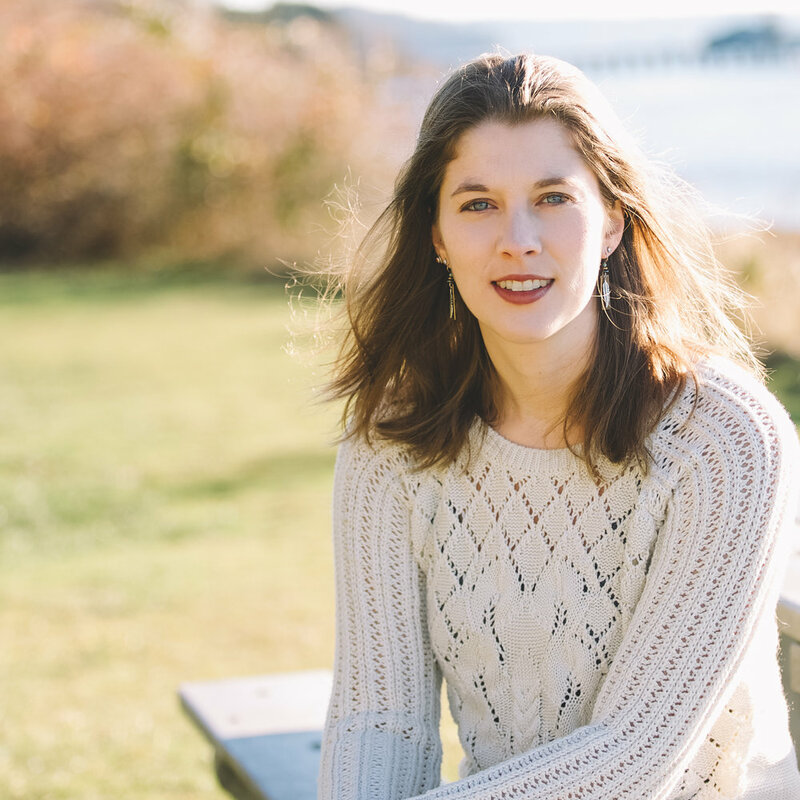 Born in Washington in 1990, Sarah has previously studied with Morten Lauridsen, and is now based in Aberdeen, where she is currently studying with Paul Mealor (whose Ave Maria will also feature in the programme). Her music has won numerous awards, and is performed around the world, including at the Cheltenham Festival and Buckingham Palace. 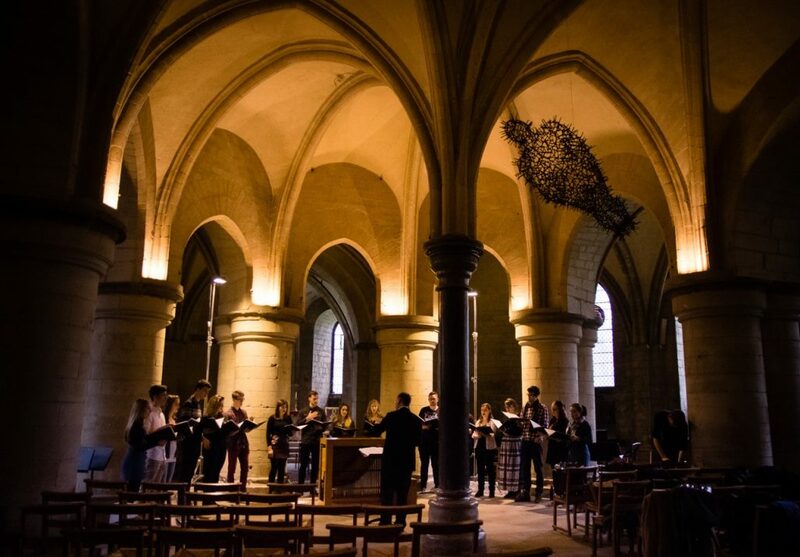 Her evocative setting of O Vos Omnes, hovering between the old world and the new, will be a luminous gem when the Chamber Choir performs in the Crypt of Canterbury Cathedral in a few weeks’ time. This entry was posted in In rehearsal, Sound thinking and tagged Chamber Choir, Crypt Concert, O Vos Omnes, Sarah Rimkus on February 5, 2018 by Daniel Harding. 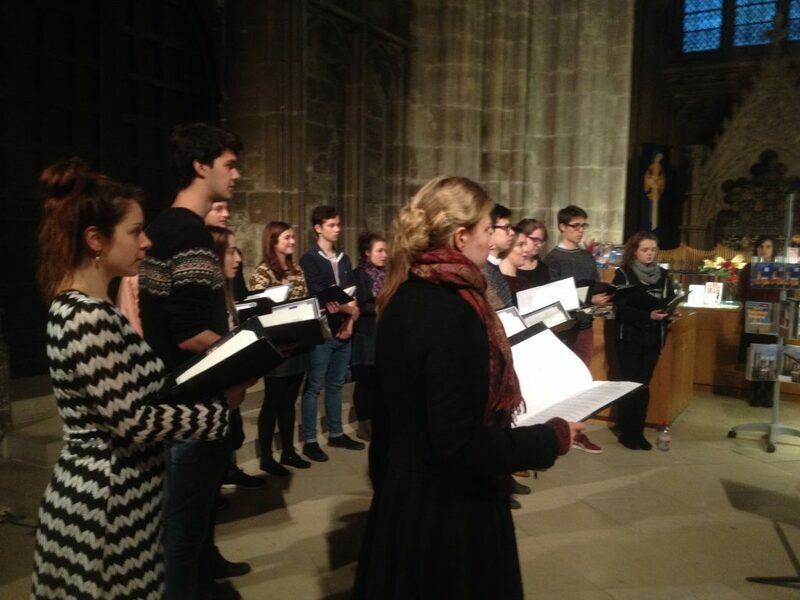 Congratulations to the University Chamber Choir, which sang as part of last night’s University Carol Service. 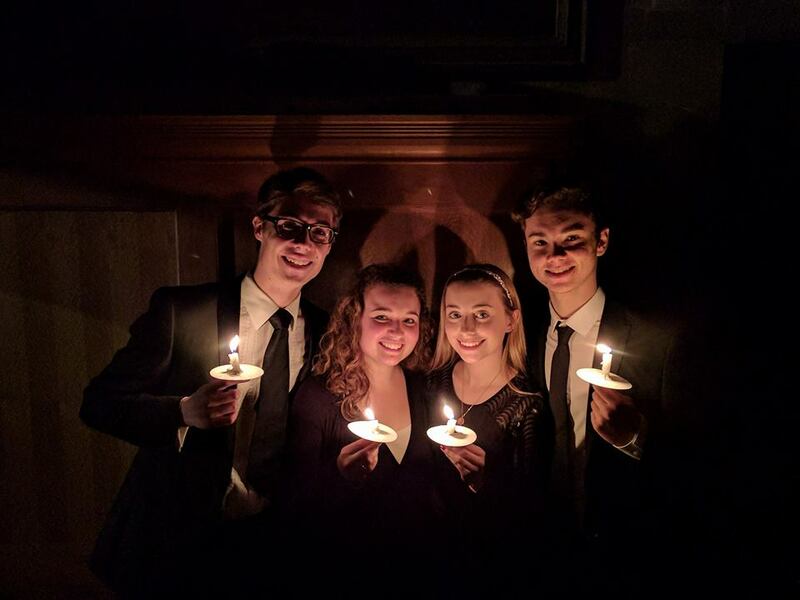 Amidst a Cathedral plunged into darkness, lit only by the dancing flames of over a thousand candles clutched by the congregation, the Chamber Choir opened the service with the energetic rhythms of Verbum Patris Umanatur by Ronald Corp; after the assembled congregation then rose, the voice of second-year soprano Fleur Sumption (pictured above, front row, second from left) lifted clear into the vaulted arches in the opening of Once in Royal David’s City – and Christmas was well and truly here. 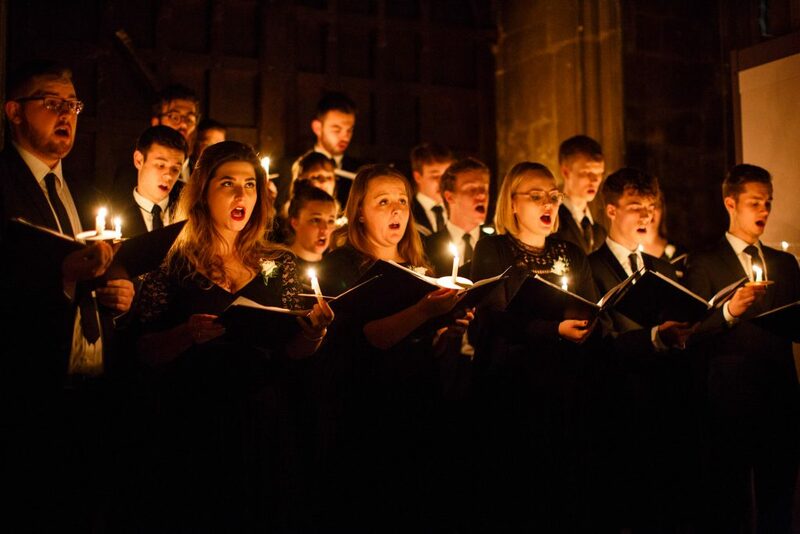 The annual University Carol Service is a wonderful occasion, each year bringing members of the University community together in words and music, closing with the people filing out of the Cathedral’s great West Door to take their candles out into the wintry night. Thanks to all the singers for their commitment to last night’s service; it all resumes next month as the Choir focuses on Pergolesi’s Stabat Mater and a mix of contemporary works as part of a colourful programme for its Crypt concert in March. From all the Choir: a merry Christmas! 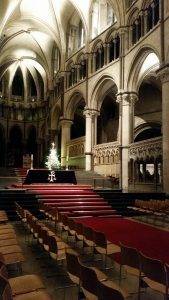 This entry was posted in All of a piece and tagged Canterbury Cathedral, Carol Service, Chamber Choir, Russell Hepplewhite on December 12, 2017 by Daniel Harding. Back in May, having shown an interest in become the new student conductor for the University Chamber Choir, I was asked to audition. Facing a choir with which I have sung and which I’ve respected so much over the past year was probably one of the toughest things I’ve had to do; describing it as walking into Lord Alan Sugar’s boardroom would be an understatement! Regardless, I was pleased with how the audition went and consequently overjoyed to find out that I would be taking on the role. I couldn’t wait to start choosing repertoire and to attend the Conductors course itself. Two weeks before I was due to attend the Sing for Pleasure summer school, a pack of music arrived at home containing the four pieces of music that I would have to prepare for the week’s course. I’ll be honest, looking at these scores I was a bit confused as to why the pieces were so simple. A musical round of 4 bars hardly seemed a challenge compared to Rachmaninoff’s Bogoroditsye Dyevo, which I’ve chosen to tackle this autumn with the choir. Nevertheless, I recorded the chosen pieces into Garageband and proceeded to ‘study’ them in the lead up to the course. I had spent a week prior to the course performing up at the Edinburgh Fringe; arriving at Keele University for the start, it was safe to say I was exhausted, but regardless I couldn’t wait to get started. The 7am start was daunting enough, but after the huge buffet breakfast followed by a strong black coffee, everything didn’t seem so bad! After breakfast we had a vocal warm-up, which every participant on each of the different courses attended. Each warm-up session focused on different warm-up techniques to engage different choirs in different situations. This was followed by a one-hour choral session taught by the tutors. 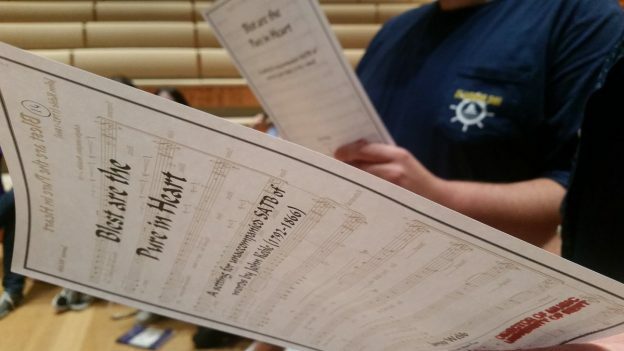 We looked at a Mass written by Ariel Ramirez, called Misa Criolla. It was a challenging piece of music in its own right, but not only did we have two days to learn and perform it, it was written in Latin-American Spanish, which surprisingly didn’t come naturally to many of the choir! Following the Choral session, we had the first technique session, where all of the foundation conductors came together to focus on the basic gestures and patterns. Firstly, we started on the correct hand position. ‘This can’t be too difficult’, was a phrase that was shortly shot out of my head the minute we started! After what seemed like an eternity of extreme concentration and focussed practise, we began our individual workshops where we split into two smaller groups (picture left) and began work on our prepared pieces. As mentioned above, the pieces didn’t seem particularly challenging, but I soon realised that even the simplest of pieces were a challenge when it came to practising the correct hand gestures and techniques learnt from the previous session. What really made these sessions so helpful and rewarding was supporting our other class mates during their section of conducting. It was particularly useful to identify common errors, and how to fix them. It was soon found to my surprise that I talk and waffle too much and move too dramatically for music that doesn’t need such gestures. Who’d have thought it! Our tutor Ruth showed us a technique to combat this. 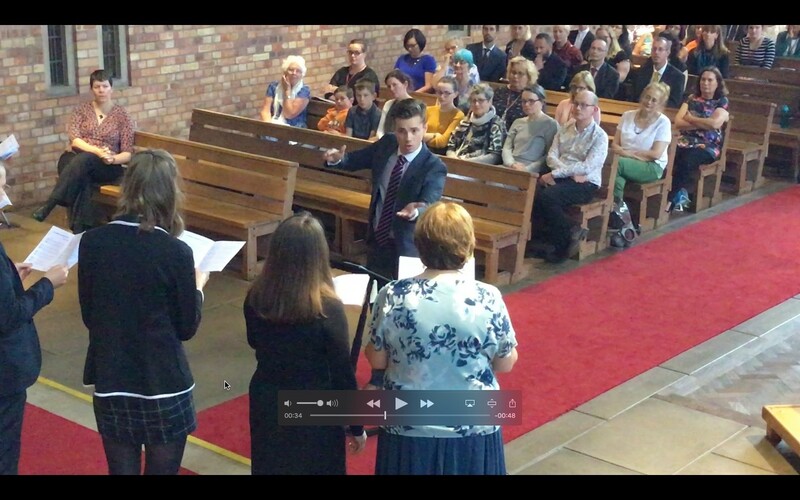 I had to stand up against the wall whilst conducting. This kept my back and shoulders against the wall, supporting a good posture, meaning that my beat pattern was the focus of the singers, rather than an over-expressive shoulder. After a freshly prepared lunch, we moved onto what was perhaps the highlight of my week. We were asked to sing for the Intermediate 2 level conductors, where they were conducting a new arrangement of some Barbershop classics. Having never sung Barbershop before it was great to find out how much I enjoyed it. The session flew by, and before dinner we had an hour of personal preparation and practise. The week has shown me that a mirror is not just for spending hours doing one’s hair, but also to repeatedly go over gestures and beat patterns for practise! The evening’s entertainment was folk-dancing. Admittedly folk dancing isn’t my strong point, but after a couple of drinks, and a disregard of my dignity, we all had a great laugh and what a fantastic ice-breaker that was! Day two was much the same, with a vocal warm-up followed by choral and technique session. We focused on 2,3 and 4-beat patterns and looking at how to start pieces which begin on an upbeat, on the bounce-anacrusis and single anacrusis, and how to use them in each time-signature. Following another brilliant Barbershop session and practise session in the mirror, we had Monday night’s entertainment, the first of two informal concerts, where anyone could offer to perform something if they wish. 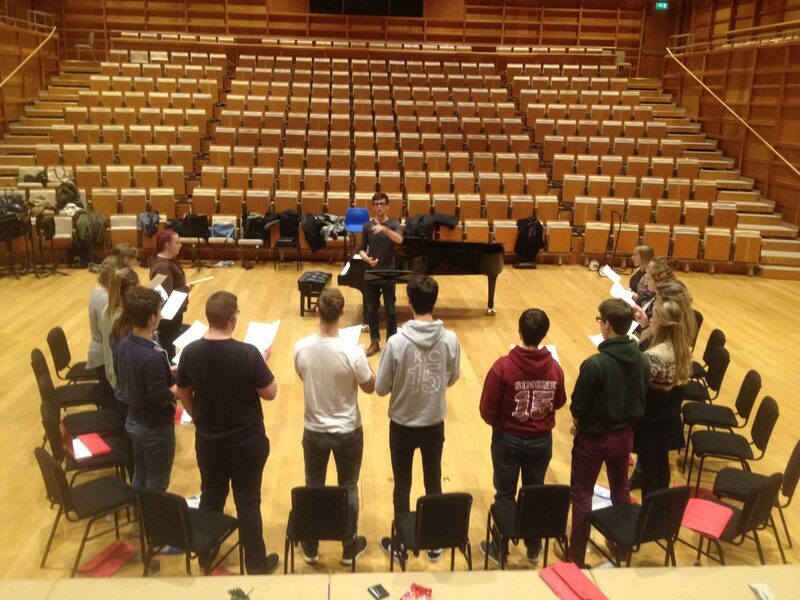 Thursday bought with it again more choral sessions this time lead by the advanced conductors. They introduced two more pieces, Vivaldi’s Beatus Vir and Emmanuel d’Astorga’s Stabat Mater, which were to be performed on the Saturday evening. Watching the skills and professionalism of the advanced conductors was a great motivation to see what we could be like in years to come. However, back in reality, we had chosen our pieces to perform in our foundation concert, I had chosen My Bonnie Lies Over the Ocean but the other songs conducted by the others included the Welsh traditional All Through the Night and American Traditional Strike the Bell. 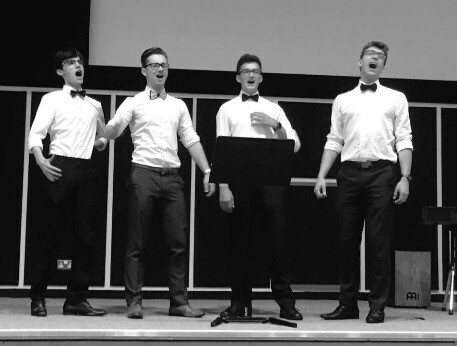 After this we had bigger things to prepare such as the performance of the Barbershop chorus, which with huge over the top reactions and moments of comic singing, went down a treat for the watching audience with laughter throughout. Overall I can’t praise and recommend Sing for Pleasure enough for the thorough and professional attitude that all the tutors have to the teaching and development of every participant. The tutors are fantastic and incredibly willing to teach and help but also friendly, making this week not one to forget. I can’t wait to book onto the next course. The week has taught me so much that will benefit many people for the years to come. I would even go as far to say, that it has inspired me to pursue a career in conducting and music, if I were to continue my training. 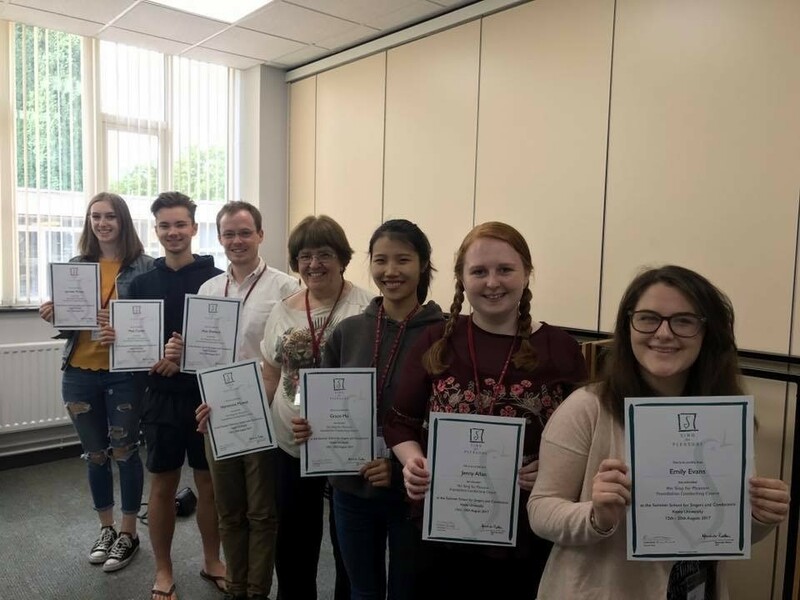 A huge ‘thank you’ to everyone who made the week a fantastic week and to those who enabled me to attend this course, I am incredibly grateful! This entry was posted in Not drowning but waving and tagged Chamber Choir, choral, conducting, course, Sing for Pleasure, singing on September 5, 2017 by Daniel Harding. 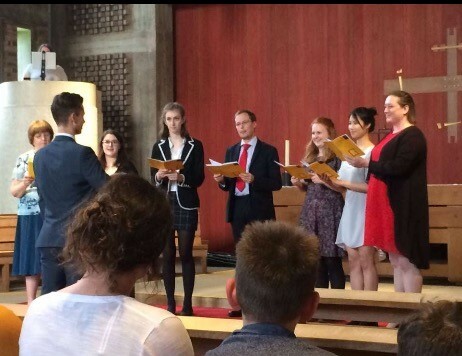 The Chamber Choir resumed rehearsals earlier this week, having had a break over Easter; the choir is preparing for two performances in June as part of Summer Music Week, the Music department’s annual festival which bids a musical farewell to the academic year. 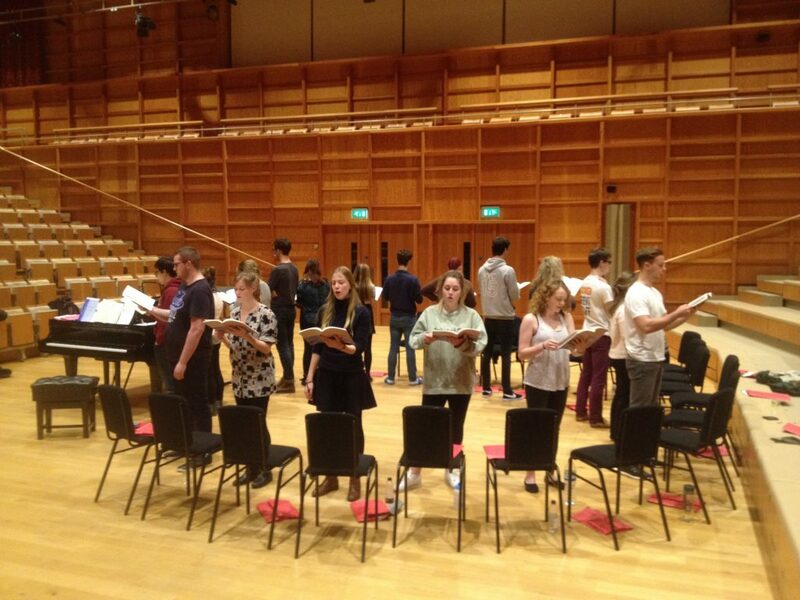 It’s a busy time for the singers, with revision and examinations and dissertations all exerting pressure – and with only five rehearsals left, rehearsal time is at a premium. 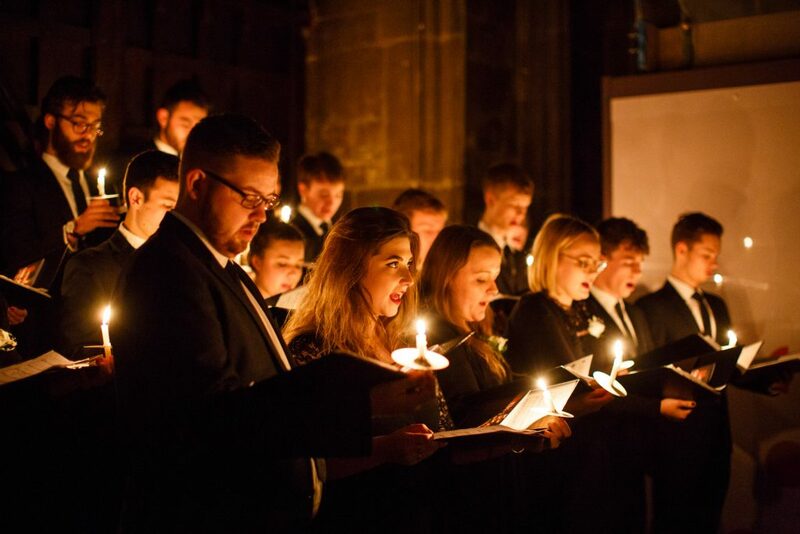 The first concert is a revisiting of the programme the Choir performed in the Cathedral Crypt back in March, which includes Fauré’s richly-hued Requiem and several tricky contemporary pieces. With so little rehearsal time this term, and members missing rehearsals as they prepare for exams, it’s an opportunity to rehearse and to perform without having the additional stress of trying to learn new repertoire. But – and this is where the magic begins – returning to pieces that you’ve already learned and delivered in the glare of the public eye is a fascinating experience; you know the pieces really well, and are confident in them because you’ve already aired them in public, and so the level of performance improves from the previous concert. There’s a new-found freedom in revisiting them, a surety that comes from trusting that you can deliver them, which leads to increased confidence, which leads to greater freedom – and so it continues. At this point in the academic year, the choir is really flying; a rich, assured ensemble sound, a tremendous pleasure in knowing the pieces will come off the page successfully. And yet…there’s always something new, some new direction the choir takes, some undiscovered aspect to its performing that emerges. And this week was no exception; as we picked started our first piece, the dynamic level reached new depths of piano and pianissimo that were entirely unpremeditated; we hadn’t elected to explore singing much more quietly than before, but there was an empathetic, collective response that found us singing much more intimately than we ever had before; and it worked. As the rehearsal unfolded, this contrast appeared in other pieces, and was particularly exciting. Where had it come from ? As the conductor, I certainly hadn’t asked for it; instead, it emerged as a result of the choir’s renewed confidence and trust in one another and in the music; the singers know the pieces extremely well, and can afford to take more risks, broaden the dynamic scope, push with greater energy, bolstered by their confidence in the unity of ensemble sound. The effect of reaching a much quieter sound served also to heighten the contrast with forte passages, which felt much louder (and more exciting) without our having to exaggerate them. That’s the best and worst thing about this point in the year; having worked so hard together since those first early steps in October, the choir has become a fully integrated musical unit, and is at its apex; in a few weeks’ time, the group will disintegrate as members graduate or go on a year abroad, and that will be that. 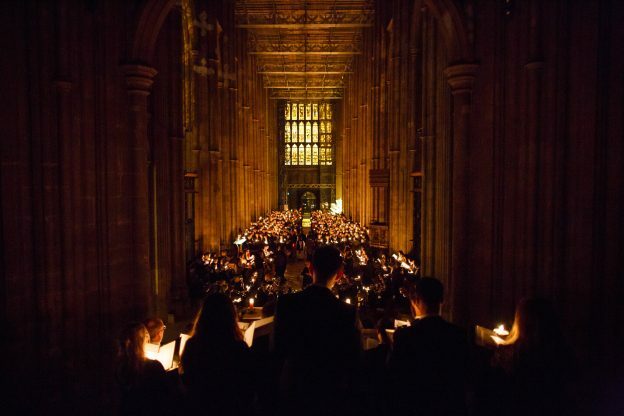 I’m reminded of that line from Blade Runner: ‘The light that burns twice as bright burns half as long.’ This choir is burning very brightly now – we have only a few short weeks left in which to enjoy it, but enjoy it we shall; next month’s revitalised programme will be quite something. 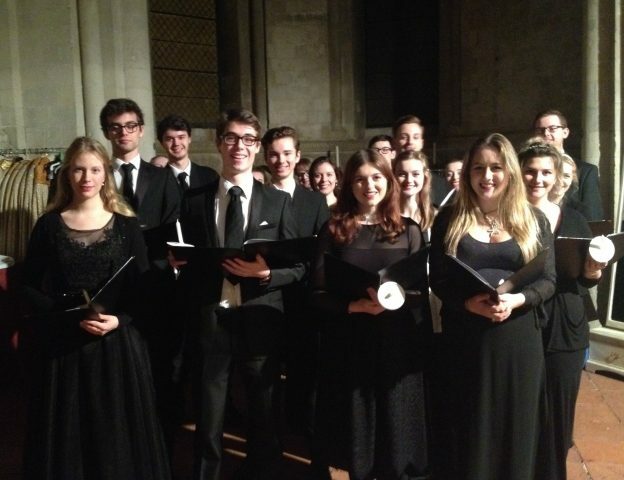 The Chamber Choir performs at St Peter’s Methodist Church, Canterbury on Friday 9 June and in Colyer-Fergusson Hall on Saturday 10 June; details here. 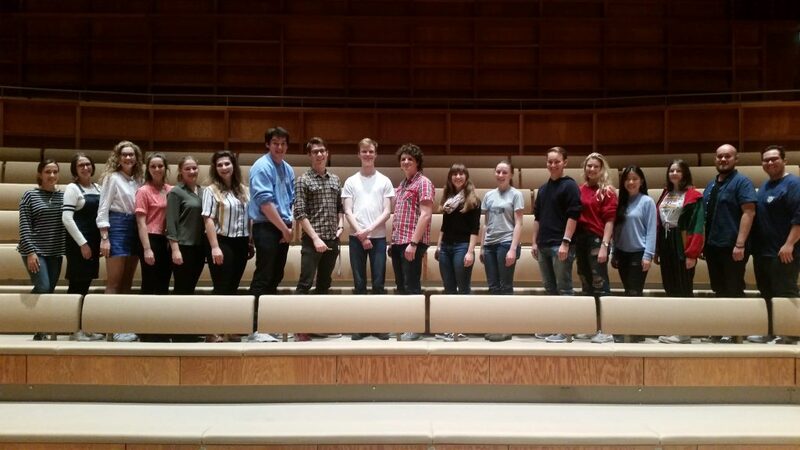 This entry was posted in In rehearsal, Sound thinking and tagged Chamber Choir, confidence, rehearsing on May 11, 2017 by Daniel Harding. 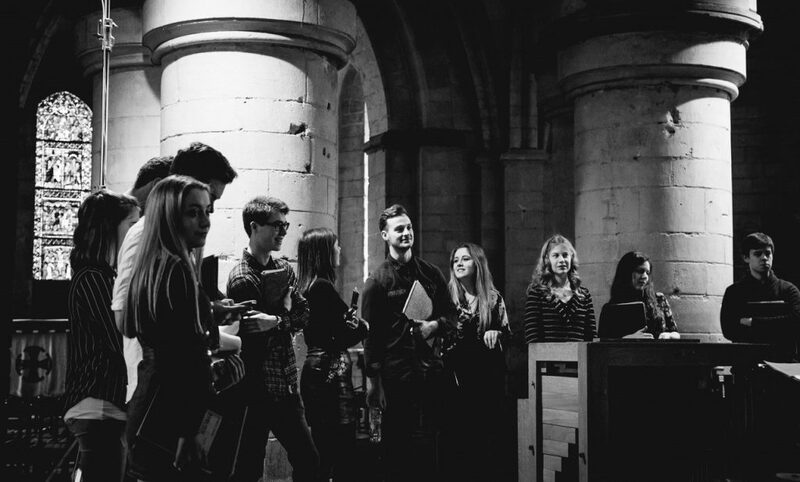 The University Chamber Choir is busy preparing for its annual concert in the Crypt of Canterbury Cathedral on Friday 3 March, and as a curtain-raiser the choir will perform in the sonorous acoustic of Studio 3 Gallery this Friday lunchtime, 24 February. Continuing the #EarBox series exploring the dialogue between music and visual art, this Friday’s event will see the choir perform amidst the gallery’s latest exhibition, Soft Formalities. 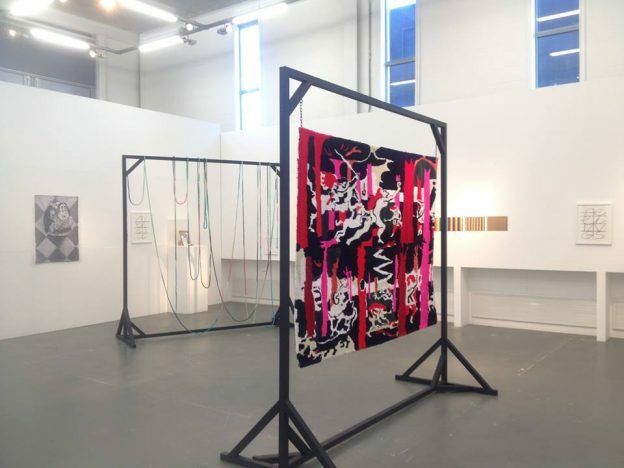 An exploration of line, form and colour in painting, tapestry and ceramics, the gallery will host an equally exploratory programme of choral music, ranging from the stark, haunting beauty of Tavener’s setting of William Blake’s The Lamb to an almost-minimalist dream awakening by Alec Roth; there’s also a tour de force Lithuanian folk-song for double choir by Vaclovas Augustinas, madrigals by Lassus, richly colourful pieces by Peter Warlock and Alexander Campkin, and more. The concert is free to attend and starts at 1.10pm in the gallery in the Jarman Building; if you can’t make it in person, the concert will be live-streamed here. 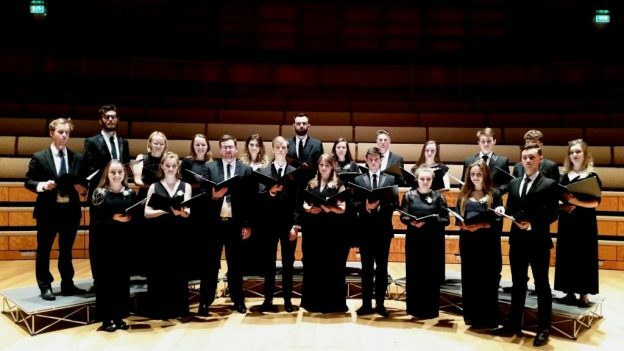 Join the Chamber Choir either live or online, as it presents a concert exploring dreams, sleep, desire, dance and lullabies in the echoing space of Studio 3 Gallery this Friday. More details here. This entry was posted in Sound thinking and tagged #EarBox, Alexander Campkin, Chamber Choir, choral, Lassus, Peter Warlock, Studio 3 Gallery, Tavener on February 20, 2017 by Daniel Harding. 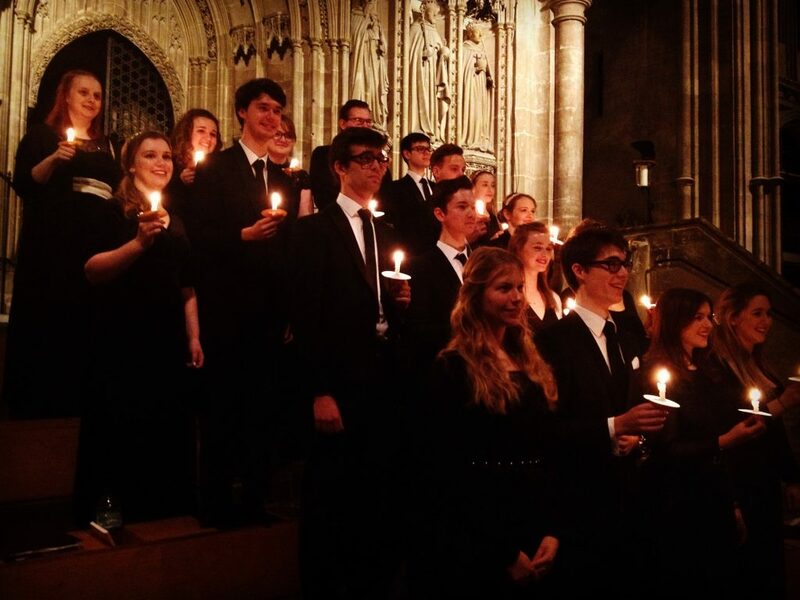 For the University Chamber Choir, December means but one thing: the candlelit magic of the annual University Carol Service in Canterbury Cathedral. 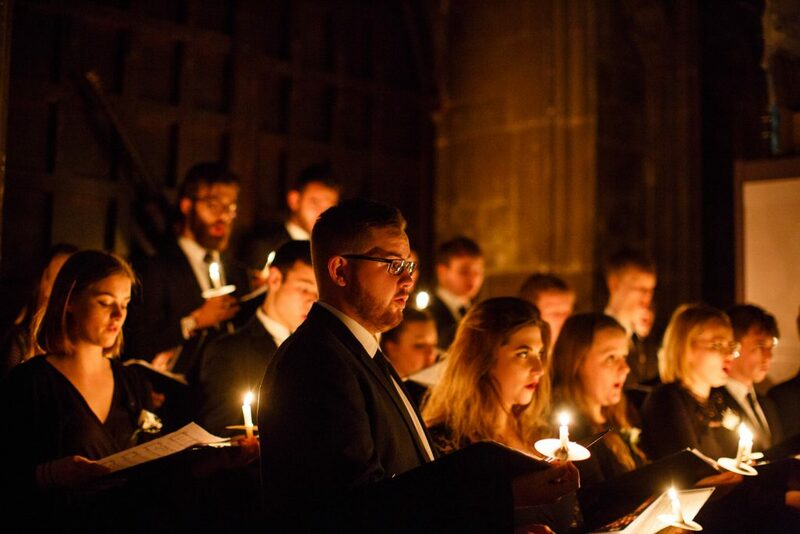 This year, the Choir performed three pieces; second-year Doug Haycock led the Choir at the West end to begin proceedings with Tavener’s The Lamb, and from the steps to the Quire, Deputy Director of Music Dan Harding conducted the richly expressive Sleep, Holy Babe by Alexander Campkin, and Andrew Carter’s arrangement of the slow movement of Peter Warlock’s ‘Capriol Suite’ into the beautiful Lullaby, My Jesus. 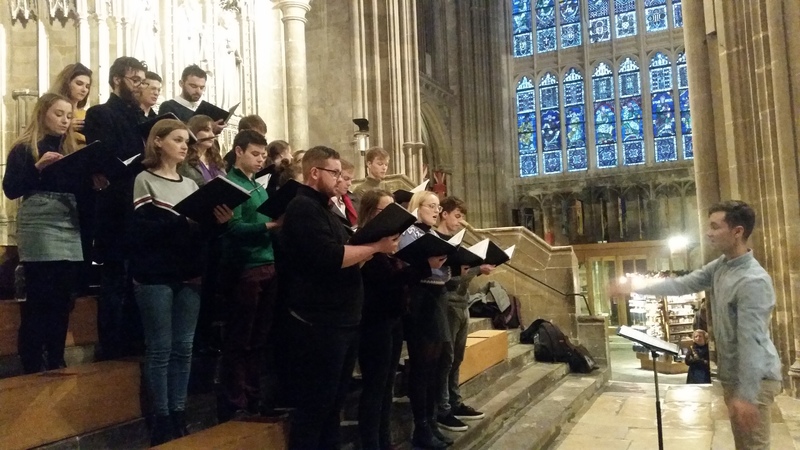 The opportunity to perform in the majestic acoustic of the Cathedral Nave is one to relish; that first point in the afternoon rehearsal, when we sing our first phrase and hear it travelling the length of the Nave, is a remarkable moment each year. After all the hard work in rehearsals from when the Choir first forms in mid-October, it’s a chance to really spread your wings, to open out the ensemble sound into that mighty reverberation and listen as it recedes amongst the pillars. The University community comes together each year at this time, to celebrate the Christmas season and being together, with carols sung in different languages to reflect its international identity; it’s always an event towards which the singers look forward with great anticipation, that moment when the Cathedral is plunged into darkness as the lights are turned out, and the Choir’s first notes rise to the dark recesses of the vaulted roof above a sea of candlelight. 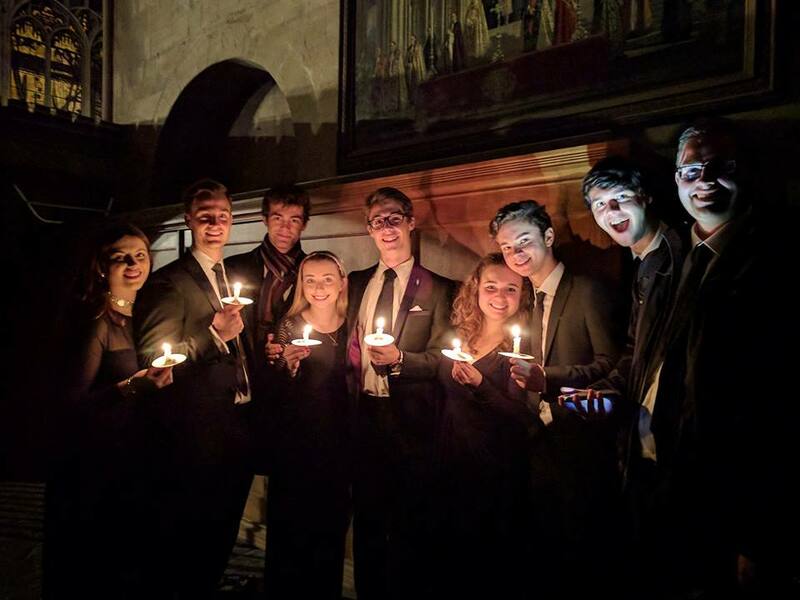 Congratulations to the Choir, and to second-year Alice Scott (pictured above, fourth from the right) whose opening solo to Once In Royal David’s City lifted clear and bright above the heads of the congregational candles to begin the service. Christmas is here. 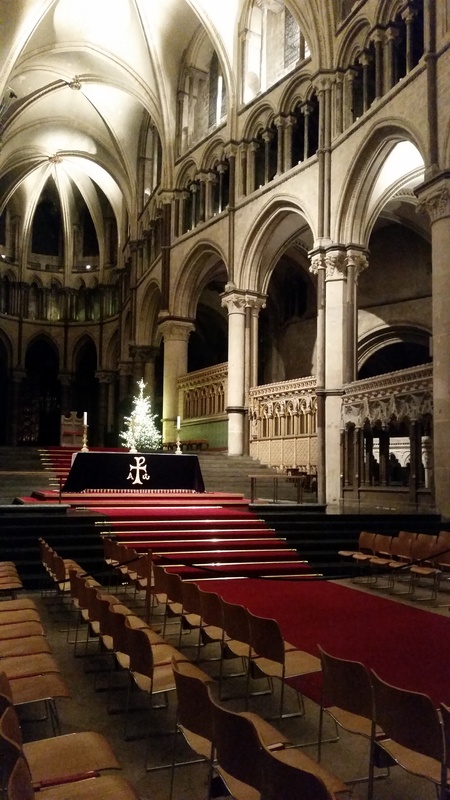 This entry was posted in Concerted effort and tagged Canterbury, Carol Service, Cathedral, Chamber Choir on December 15, 2016 by Daniel Harding. At last night’s rehearsal, we spent a large part of the time with our backs to one another, not looking at each other, not watching the conductor. Before you ask, no, we hadn’t had a row; we were working on singing as an ensemble, listening to one another, keeping an internal pulse so that we all moved together, and not waiting for others. That shared, indrawn breath that anticpates the start of a phrase; that sense of not waiting for your neighbour to sing, but taking the lead; last night was largely about developing an ensemble instinct. When you’re all facing outwards, standing in a circle, there’s no eye-contact, no conductor to watch, no ability to wait for someone else; you have to take charge of your own line, count strictly, enter with confidence; there’s also a need, at pauses or at the end of a verse, to breathe together. Listening becomes crucial: there’s no other way to establish contact with anyone else, and the need for everyone to count rather than rely on a conductor to lead the beats of the bar is critical to keeping the music flowing. There were moments where this worked very well; there were also moments when words ended at slightly different times amongst the voices, consonants tripped early and peppered the sound, and some entries were rather hesitant. The more we do of this, though, the better we will be as an ensemble. Assistant conductor Doug worked with the Choir on establishing consistent vowel-shapes in works by Hassler and Purcell, on using the right sounds and avoiding diphthongs. This entry was posted in In rehearsal and tagged Chamber Choir, circle time, rehearsing on November 16, 2016 by Daniel Harding.